Myron Pierman Mynie Sutton was born October 9, 1903 in Niagara Falls, Ontario, and died there June 17, 1982. He began piano lessons at age nine with a church organist, and he began clarinet lessons when he was 17. He later took up alto saxophone. While attending Stamford Collegiate he played piano at dances, and at 18 he joined St. Anne's Symphonic Band, playing clarinet. 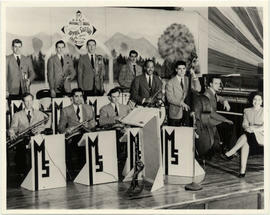 At age 19 he organized a school band and joined a quartet in Niagara Falls, N.Y. He quit school in Grade 12 and played in pianist Joe Stewart's dance band from 1924 to 1926. He was also a member of the Birds of Paradise, a nine-piece band led by Eugene Primus. He declined trombonist J. C. Higginbotham's invitation to accompany him in New York City around 1927, preferring to join tuba player Lester Vactor's Royal Ambassadors, a 10-piece band working in Buffalo, until they disbanded in 1931. Back in Canada in 1931 he and pianist John Walden formed a six-piece band, the Canadian Ambassadors, which was based in Guelph, Ontario. In 1933 the band moved to Montreal. During the next six years, Sutton led the band through a series of short-term engagements in different cities. He wrote many arrangements and at least one original composition, Moanin' at the Montmartre, for the Canadian Ambassadors. The Canadian Ambassadors disbanded in 1939. Between 1933 and 1941, he frequently lead small bands, usually quintets drawn from the Canadian Ambassadors. He registered two songs for copyright in the United States, To See You Smile and Dreams Seldom Come True. He was a member of the Canadian Clef Club, a musicians' association. In 1941, with the intention of quitting music, he gave away his clarinet and moved back to Niagara Falls to take care of his mother. He worked as a welder at Abex Industries from 1943 until he retired in 1973. Soon after returning to Niagara Falls he was asked to put together a band for a dance, and continued to lead the 10-piece group part-time until 1945. Thereafter he worked with several pick-up bands, including a quartet called the Casuals. He gave private saxophone lessons. He served more than 30 years on the executive board of the Niagara Region Musicians' Association, where he became a life member in 1967. He founded the Canadian Brotherhood Club of Niagara Falls in 1945 and served as president until his death. In May 1977 he was honoured by the Niagara Promotions Association for outstanding community service as a musician. He continued performing until two weeks before his death. The papers of Myron Sutton were donated to the Concordia University Archives by John Gilmore on behalf of May Sutton (widow of Myron Sutton) on December 19, 1984. Mr. Gilmore received the papers from May Sutton on July 19, 1984, in Niagara Falls, Ontario. The fonds was transferred from Concordia University's Records Management and Archives Department to Concordia University Libraries' Special Collections March 16-17, 2016, April 19, 2016, April 26, 2016, May 3, 2016, and May 10, 2016. The fonds provides an overview of Myron Sutton's musical career in the United States and Canada, particularly Montreal. It documents the careers of the various bands with which Myron Sutton was affiliated, and those he led, including the Royal Ambassadors and the Canadian Ambassadors. It also provides general information on the jazz music scene and Montreal night life during the 1930s. The fonds consists of sound recordings and a scrapbook containing correspondence, contracts, programs, press clippings, and photographs. Some sound recordings have been transferred onto digital tape. The scrapbook has been digitized for consultation. The scrapbook has been restored and placed in protective containers.